cover design © 2003 Ardy M. Scott. 2003 Dream Realm Award in the Young Adult category. The first time I visited the Land on the Rim of Time I actually had no choice. My parents had died in a car crash a few months earlier and I had many unpleasant dreams at nights. The time rip had come open in my bedroom after one especially intense nightmare. I thought the rip was an ordinary hallucination of the kind you sometimes get after a dream before being fully awake. Then the dream's pictures linger a while on the eye's retina and are seen as mirages or ghosts in the room, although one has in fact quit dreaming. I don't know if this happens to everyone. It happens rather often to me anyway, and the pictures can be very fascinating. Figures of shadow or of light seem to be standing in the room, but they are only illusions, lies to the mind. After a while, they fade away and disappear, leaving only the too well known everyday view to watch. This makes me a bit disappointed; I would rather see a real ghost just once. At this time, a trembling, shining rip--about a yard long--hung in the air over the bedroom floor. I was half-awake when I left my bed to have a look at this peculiar light phenomenon. Had I really dreamed about a light-rip floating in the air? I took some drowsy steps towards it. Suddenly it sucked me in with great power and I noticed that I could no longer see, hear or breathe. Even before I got scared, I tumbled out on a forest path. It was dark except for a big white moon and the glowing rip, which had thrown me out. Its light became weaker and weaker until it faded out completely. Beside the path where I lay more or less spread out, a woman was squatting. "My name is Vahinya. I really do apologize, it was not my intention that you should end up here." My illusory images usually did not speak. At least not if I was awake myself. Perhaps I had fallen on the bedroom floor and hit my head severely. Or I was back in my bed starting on a new dream. The cat-like woman looked sincere and friendly and was radiating some kind of mild self-assuredness. I decided that I too would introduce myself, as if I were awake and assuming all this was for real. "My name is Petra Bravo," I said, sending a grateful thought to my absent parents, for not having christened me Britta. Britta Bravo is a very stupid-sounding name. My brother's name is Max Bravo. He is an artist and the name sounds good for that purpose. Maybe it explains why he is so successful at getting grants of all kinds. To me, the sculptures he produces look like gnarled black snails. They are extremely ugly, but on the other hand, he uses a lot of beautiful words when he explains why he is creating them. As for myself, I study genetics at the University of Stockholm. My great interest is the hidden human disposition towards evil. It is obvious that we have a genetic need for goodness, but why do we have evil? My goal is to find the explanation in one or several human genes. In my daydreams I imagine myself wiping out all evil and being awarded the Nobel Prize in biology. "Did you make that shining rip in the air?" I asked. "Well, I suppose I have to admit that I did," she said. "It is a time rip. I'm training myself to pronounce the spell in the right way." "It landed in my bedroom," I said. The night was cool in a summerish way. Nevertheless I felt the draught of small ice-cold currents of air through my thin pyjamas. There were pine needles on the path under my feet. Around me, vaguely distinguishable, was a high-grown forest of the kind that seems to be wild, but where in fact somebody regularly removes dead branches and brushwood. "The time rip has disappeared, and I need some time to make a new one, especially if it is supposed to lead in the opposite direction while still keeping its exact coordinates," the cat-woman said. I was so confused I had forgotten her name. The chilly night wind continued to attack me in irregular puffs. It was no ordinary breeze. The draught of the wind felt nasty, as if it lived and had a will and could interfere with my thoughts. It became a song in my head: Cold, wind, more, worse, always, cold, wind, more, worse, always... The song had strange, unfamiliar words and sounds, yet I knew their meaning: Eternal cold and destruction of all growing and living things was the wind's desire. "We must get indoors to protect ourselves from the wind, and you must get some proper clothes." The black-haired fairy-tale woman with her chalky white face took my hands in a firm grip. Her hands were warm and steady and felt much stronger than they could possibly have been. She gazed with her green cat-eyes (to be sure, they were not slanted) deep into my own brown eyes, and the contact created an unbelievable feeling. A completely different mind lived behind those strange eyes. I could only compare this with a few occasions when I had gazed for quite a while into the eyes of a cat. She uttered a short string of words, her voice sounding hard and efficient. Efficient it must have been indeed, because the forest path disappeared at once, being replaced by the mild, flickering light from an open fire in a room. The gloomy thought of the world transformed into an eternally cold, windy and horrible place left my mind. I looked around, curious. A lecture hall, was my first thought. A large room with a lot of darkish brown wood in walls and furniture. The chairs seemed to be oaken with stuffed leather seats. On the walls hung posters with strange diagrams, which made me think of astrology. If it hadn't been for the computer screens and keyboards I would have thought myself transposed to the Middle Ages. A fire was burning in a fireplace. One of the tables was laid with bread, cheese and a pot where steam from the spout suggested some kind of tea. In front of one of the computers sat an elderly man with grey hair brushed back. On a chair beside him lay a dark grey, shimmering cloak like the one my companion was wearing. He rose and came towards us, and I noticed that he too had almost chalk-white skin and eyes with pupils like a cat, although the iris filling the rest of the eye was dark blue. "Welcome back, Magicand Shaz Vahinya," he said. "Are you satisfied with the result of your laboratory experiment? It evidently has produced a quite unexpected result, at least partly." "So it has, indeed," said Vahinya, whose name he made me remember. "This is Petra Bravo. The time rip unfortunately happened to land in her bedroom." The man turned towards me and with elegance brought his finger-tips together in what looked like a greeting. I answered his gesture awkwardly since my fingers wanted to get entangled. It made me remember when I on one occasion tried to 'give the finger' to another car driver and my untrained fingers instead did 'thumbs up'. 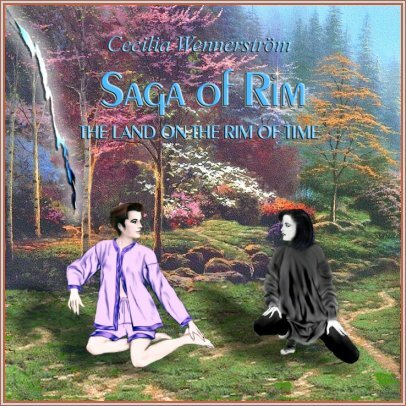 "Welcome to Rim, Human Petra Bravo," the man said, "or, more precisely, to the Land on the Rim of Time. We usually don't bother with an everyday use of this long name. The full name is mostly used in poetry, documents and other ceremonious occasions. We use Rim for the most part." I still took it for granted that I was dreaming. My brother Max claims that we can never know if we are fully awake even when we think we are. I hoped he was right, since I felt fully awake, which made me a bit scared. "My name is Magician Shaz Erarc. The reason you have ended up here is an experiment that Magicand Vahinya performed while she was qualifying to be a fully-fledged magician. Her task was to create what we call a 'time rip', a short-lived opening into another space-time or dimension. The position co-ordinates are the same but the time co-ordinates and some dimension co-ordinates are varied. This takes some rather difficult calculations along with some complicated magical formulas. A considerable amount of inborn magical talent is also needed, and Vahinya has this gift to a great extent. You experienced her ability a little while ago when she teleported you and herself a distance of more than three miles. At a rough estimate, I would say only a hundred Shazes per generation are able to do this. Among the Foxmen, even fewer. The Yimbouks are, of course, the real experts." "How many species are there on Rim?" I asked with some effort. "It would be better if you studied all those matters later on," Vahinya said. "For now I suggest that you put on some clothes and that we try to get some food--as a matter of fact I'm ravenous. The making of that time rip was hard work and I haven't had a proper meal in days." She looked towards the double doors at the far end of the room. "By the way, I think that your clothes have arrived." Through one of the doors came a lean, red-haired young man carrying a bundle of clothes. He looked very human, having friendly, somewhat slanted blue eyes and high cheekbones. The corners of his mouth angled a bit upwards in a cheerful way. I found him good-looking. "This is Magicand Foxman Aerwinwath," Vahinya said. "He brought some clothes for you to wear while I try to make another time rip to make it possible for you to return to your own world. Unfortunately I will need one or two days to accomplish this task." Aerwinwath put the pile of clothes on a chair, in doing so turning away a little. At his back was a big, bushy foxtail. Afterwards he turned to me and politely put his long, slender fingers against one another in a greeting. I had better luck this time with my fingers answering his gesture. I changed clothes behind a big armchair. Sweater, trousers, and short boots--nothing except for the cloak differed noticeably from my own ordinary clothes. The soft, strong cloth was blue and brown, except for the cloak which was made of a rough homespun grey cloth with glittering threads woven into it. It seemed to be an outdoor garment, so I folded it together and hung it for the time being over the armrest of the chair. In one of the trouser pockets my hand felt a small cube. I grabbed it and took it out of the pocket. It looked similar to the small device being used by Vahinya when we met on the forest path. "I can see that you have found the translator," Aerwinwath said. "You won't need it right now since the rest of us have our translators turned on. But you will need the translator cube when you use our computers. It might amuse you to read a little about Rim in our virtual libraries." With curiosity, I approached one of the keyboards. Every key was transparent, and the signs underneath the covering no doubt looked like letters, but no letters that I had ever seen before. I found a small button on one side of the cube. Pressing the button made the keyboard flicker and change its symbols to the familiar European letters. "Now the computer has noticed what type of species you are," Aerwinwath said. "I have set the cube especially for your type of Homo Sapiens." He seemed alarmingly real for a figure in a dream. In any case, it was evident that he had a thorough knowledge of the human race. "You must have been visited by other humans before me," I said. The two Shazes and the Foxman quickly exchanged glances. Evidently they were coming to an agreement on which one of them would answer this delicate question. Finally, the older magician broke the silence. "Human Petra Bravo," he said in his formal way, "the answer to your question is yes. We know about the human race and we have occasionally been visited by you. In a few cases, we ourselves have visited you. As a matter of fact, Knowledge of Human Nature and The History of Homo Sapiens are subjects here at the University of Rim. But if we were to answer all your questions, which in their turn will only raise other questions, we would starve to death. You can get as much information as you like during the short time you will spend here. For the moment the best thing you can do is to suppress your curiosity and join our meal." Having said this he seated himself at the table, poured a greenish tea into four cups and spread thick layers of a yellowish-brown viscous mass on a piece of bread. "There is nothing like rowan-honey," he said. "If I hadn't been a magician I would have been a honeymaker." "In that case you would have had to transform yourself into a Rowanwoman first, since only Rowanwomen can be honeymakers," Aerwinwath said. "And you would have had to live together with a Yimbouk." "It would have been worth it," Shaz Erarc said. We had been eating for some silent minutes when suddenly a sharp, whining sound from a breeze was heard outside the house. My partners at the table listened with great tension. Shortly afterwards the sound disappeared, and everybody continued drinking their tea without making any comments. It was early morning now and the sky of dawn was light outside the big windows. The tea tasted very good, like flowers. I felt sleepy and did not object when Vahinya suggested that I could sleep for a while in a guestroom nearby, where the pictures on the walls had beautiful forest motifs. I fell asleep almost immediately, drowsily thinking that it must be the same thing twice to fall asleep in a dream. In the dream inside my dream, a tiny, evil voice kept whispering about eternal cold and a merciless wind. Saga of Rim Copyright © 2003. Cecilia Wennerström. All rights reserved by the author. Please do not copy without permission. Translated from Swedish by Cecilia Wennerström. Language-checked by Anne Cleaves. Cecilia Wennerström is a jazz musician, saxophone player, composer and arranger, educated at the music academies in Malmoe and Gothenburg. She was born in 1947 and lives in Stockholm, Sweden. Since 1994 she has played baritone saxophone with the internationally known Swedish tenor saxophone player Nisse Sandströms 10-piece band which plays transcriptions of Miles Davis/Gil Evans tuba band music. Among many memorable concerts is one with Rolf Eriksson on trumpet at the festival Jazz at Nyköpingshus 1995. One of Swedens best jazz singers, Peo Jönis, is the leader of a ladies big band, Satin Dolls, where Wennerström has played the baritone sax for several years and also does some arranging for the band. Satin Dolls is an entertainment band and has been quite involved with Swedish television. Wennerström also leads a Marty Paich-style 12-piece orchestra of her own which plays her arrangements, for instance at the jazz festival Sandviken Big Band Bang in 1996. More information on Cecilia can be found at her web site. Saga of Rim is the winner of the Dream Realm Award in the Young Adult category. A fun combination of reality and fantasy with emphasis on fantasy. A great place to meet new heroes and villains who display some very human tendencies. Petra Bravo is a young girl who travels to Rim through a time warp created by a magician called Vahinya, who turns out to be a very good friend, even when she is occupying a cat's body. In Rim, it is found Petra's coming was foretold in old legends and that she would be "a being of your kind" who would help with a problem concerning a destructive icy wind. A second adventure involves the city ruled by Jadnan and populated by the grey children. Here Petra meets Kveggla, house- keeper to an evil demon who was exiled many thousands of years before in a battle of wills and magic. Petra's third adventure is when she is captured by Ramgor after she goes to the Mountain of Evil Dreams to help free Vahinya who is held there. This is a story that could easily be the first in a series of exciting adventures for Petra and her new friends. "Rim" introduces the young reader to the world of fantasy, and stretches the imagination in visiting places like the Sea of Sorrow or the place where the Lantern people live. Highly recommended as a read to please any reader. Enjoy. Reviewed by Anne K. Edwards, author of Journey into Terror and Reviewer for eBook Reviews Weekly. Petra Bravo first learned of the Land on the Rim of Time when she was transported there to defeat a rather minor threat. During her brief stay, she learned about the eons old land out of time where magical beings descended from demons lived and observed other worlds. It was a peaceful, happy place, with only one enemy, a demon who refused to be adapted into a peaceful creature and now lurked in a void, waiting to re-enter some world and wreck havoc. Upon returning home, it all becomes rather like a dream, a distant memory to Petra. Then, one of her friends takes control of her cat to warn her that the demon, Ragmor is poised to strike. Petra is needed to help defeat him. So it is that she embarks on a fantastic odyssey where her inner strength is her greatest weapon. Demonized gnomes, ages old mythic evils, and beings that are purely mean will stand in her way using trickery and cruelty to hinder her quest. Then, when facing her foe, love may be the thing that overcomes her. If you are a fan of quests and fantastic worlds, no matter your age, you will be charmed by this book. It has a sweetness and grit that all classic fairy tales share, and an originality that keeps it from being tired and trite. Reviewed by Amanda Faye for The Eternal Night. Web site Copyright © 1999, 2000 - 2009. Lida Quillen. All rights reserved. Cover design © 2003 Ardy M. Scott. All rights reserved. This page last updated 01-02-09.